Each board provides 4 natural white LEDs in a non-polarized light from either a 6.3V source. Because the board has a built-in rectifier bridge; you can supply power from both a 6.3VAC GI circuit or ~6.3VDC controlled insert. You can even control the brightness via a microcontroller PWM signal or from one of the new DIY control systems such as the PROC or its PD-LED driver board. The design also features a brightness resistor at R5 to allow you to dial the brightness to your desired level. A hole in the center of our PCB allows the actuator to work from the insert to a standard Leaf switch typically under the insert. A typical installation may require a set of #6-32 x 0.25 inch wood screws so you can bolt it to the back of the playfield under the star rollover insert. Electrical installation is super simple; simply solder the GI connection from the old horizontal lamp socket to the JGI connection, or jump to the nearest GI socket as we did in our machine below. 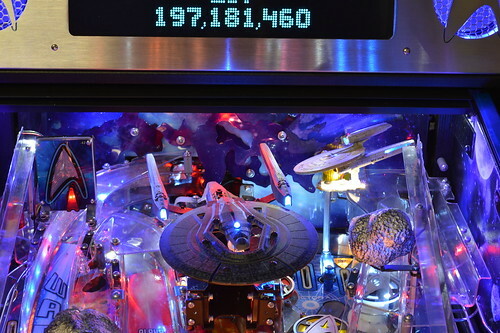 Here is an example installation we did on our Star Trek: The Mirror Universe custom pinball machine. We are pleased to announce the official launch and immediate availability of our Nebula Backbox lighting kit for the Stern Star Trek Pinball Machines. 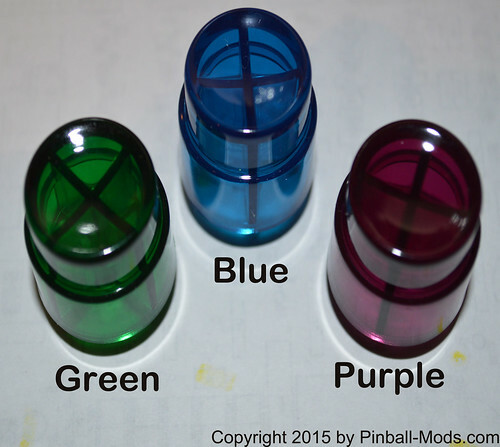 While the product has been available on our site for almost a month; we just completed our detailed step-by-step instructions to aid you in installing it in any Stern Star Trek Pinball machine – enabling us to make the product official with this announcement. 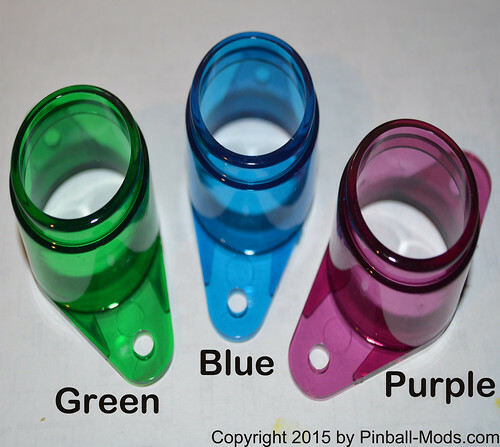 This kit comes with a set of three Printed circuit Board Assemblies (PBAs) which you snap apart and install behind the stock nebula plastics on a Pro, Premium, or Limited Edition pinball machine’s Back board. 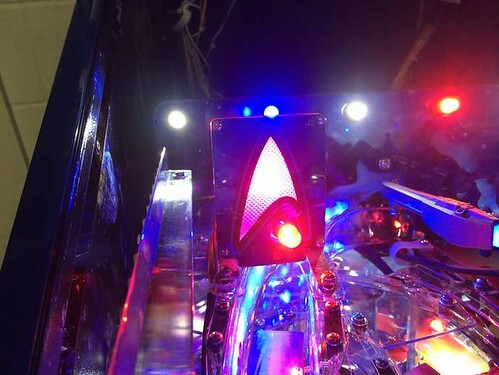 Like our Kelvin product; it is 100% compatible with the PWM circuitry on our GI Dimmer so the customer can dim or control the Nebula lighting for both Normal and Klingon MultiBall modes. and may take a couple of hours to complete. I am pleased to announce the immediate availability of our USS Kelvin mod for the Hallmark USS Kelvin. This pair of PBAs will bathe your USS Kelvin in a natural white glow provided by 3 LEDs in the base PBA while providing proper power regulation to the interior ship’s LEDs provided by Hallmark. The base PBA includes a variable resistor to allow the user to adjust the Stadium LEDs to their desired setting. 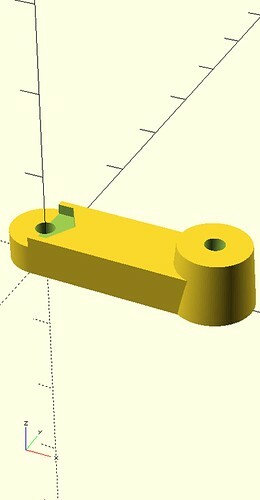 The kit includes a translucent custom-made 3D Printed bracket which is also available at our ShapeWays shop. Additionally, this assembly is 100% compatible with the PWM circuitry on our GI Dimmer so the customer can dim or control the Ship for both Normal and Klingon MultiBall modes. and should only take a couple of hours to complete. 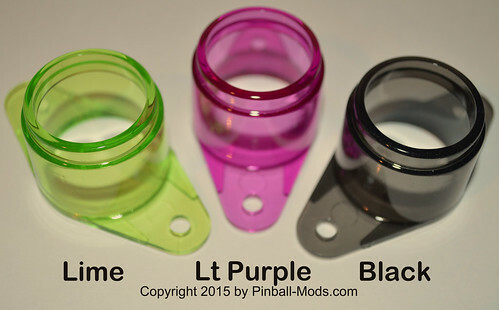 Pinball-Mods.com is pleased to announce the immediate availability of a Laser upgrade kit for your Stern Star Trek Premium or Limited Edition pinball machine. We offer a higher power Red laser module if you wish to remain “stock” but have just a little more “punch” so it can be seen. We also have a green laser module similar to other offerings. 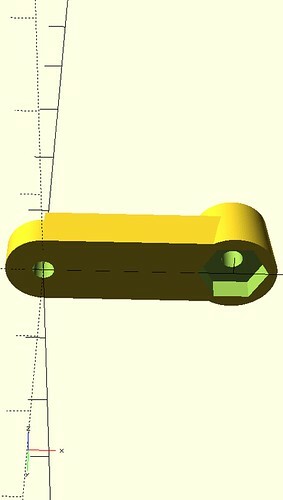 However, what sets us apart from the competition is we are the first to offer a blue laser module for these machines. Why blue; well I think it’s a better match to the LE machines and the Playfield graphics. Our kits come with the laser module, a custom cable harness with bolts into the stock harness – no alligator clips, no fuss, no mess. Our harness has a built-in Voltage Regulator Modules to power our custom-designed modules. Detailed Step-By-Step Instructions are available here or on our product page. Not sure which color you want? Check out our Youtube videos comparing the three colors against the stock red laser pointer. Please note: These videos were taken without our Stern GI Dimmer installed; so the General Illumination is at 100% as it came from Stern. These videos are 1920×1080 HD; so feel free to click thru to Youtube and/or go full screen. 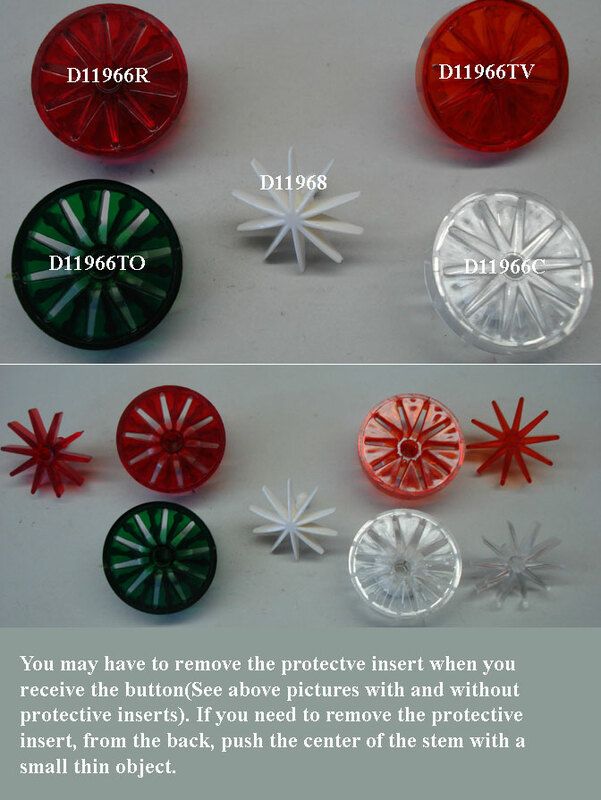 The Gottlieb BUSHING FOR DOUBLE PUSHBUTTON #B-21018 is not currently available; however, it should be possible to modify our buttons easily to replicate them. I’ll try to spend some time in the future to publish a how-to-modify here in this blog if there is interest. Colors are show below and should represent the colors available. Please Note:Keep in mind your monitor and my camera’s color balance will throw the colors off a bit from the actual product you receive so use these as an approximation of what will be shipped to you. 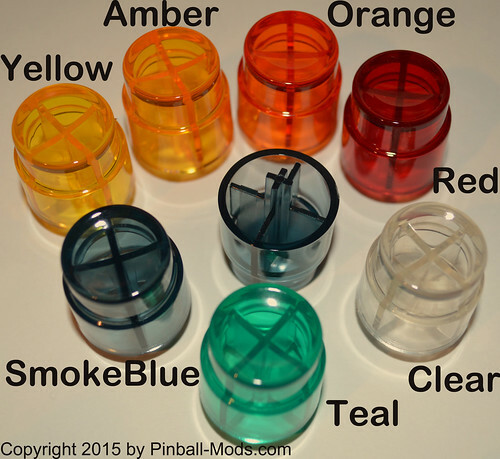 Both the Housings and Buttons are made out of PMMA (Acrylic) so they can be easily laser etched and paint filled like I did on my Original Bally Star Trek Restoration. 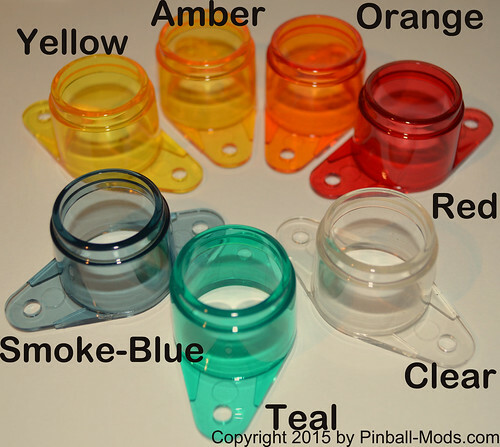 Please let us know if there is a color not represented here… or if you’d like to see some opaque colors made. 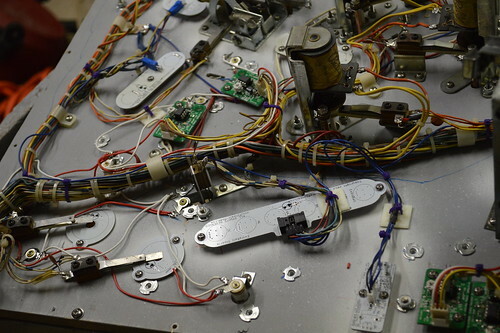 I’d also like to call Attention to a product we’ve had on the website for a couple of months… The Bally Flipper Mod was designed by myself several years ago for the Bally Star Trek Restoration. Each PCB features 12 LEDs in either Red or Green and rotated the LEDs to simulate a rotating pattern. 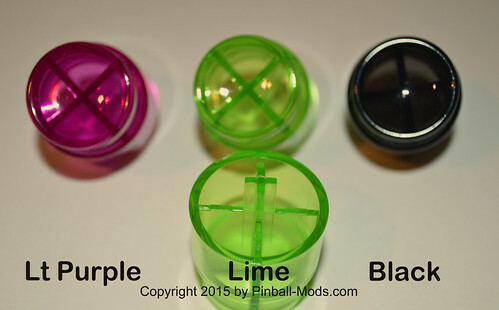 I’ve held off announcing them here because I wanted to get the companion buttons on the website so fellow Pinheads would have the option of buying them with the colored button of their choice – IE one stop shopping. for more information or to purchase this modification. I’ve been spending the last year or so playing with the Intel Arduino products – Namely the Intel Galileo and the Intel Edison. One of my projects the last few months has been Making a LinuxFromScratch Linux Kernel with full build tools, Xwindows, and QEMU running WinXP SP3. Included in this build is a XWindows software FrameBuffer w/ VNC capability; that way I can run a networked gui and do some GUI type work. The Edison is cool because it’s just powerful enough to run WinXP under QEMU without any software emulation. While I wouldn’t call the Edision a speed demon – it should be good enough to allow printer drivers to function. The onboard storage for the Edison isn’t really big enough to run WinXP from the eMMC flash; so I opted to run a SSD attached to the USB2.0 port of the Edison. Edison runs as the “master”. The end goal of providing “always on” scanner and printer driver capabilities for my old HP all-in-one color laser and the ULS-25E laser cutter. I also wanted to run a rotational drive .. to act as a swap space for both Linux and for the Winblows PageTable. To do this; I built a Microdrive FLEX to 44pin 2.5″ IDE adapter board and attached it to the Edison via a usb->ATA adapter. I verified all of this works with a usb hub. With the concept proven; I set about generating a Intel Edison USB Storage Sled. This PCB provides power to the Edision and then connects up a 4port USB hub. This hub then serves the USB->SATA->mPCIe->Intel SSD, a USB->PATA->flexIDE Microdrive, and an extra device port. I set about putting the Sled in a SparkFun Edison Block compatible form factor early in the design phase. Clearly this much stuff on one board prevents me from adhering to the tiny formfactor; so I grew it in the X direction to 4.5″ wide and about 2.1″ tall. 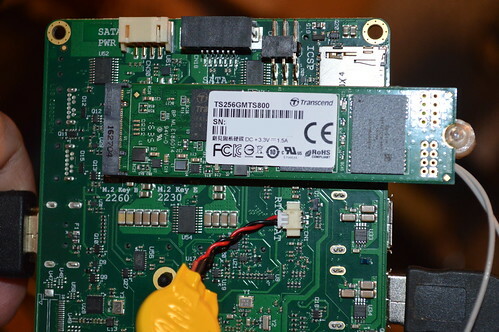 This board provides all the power to run the SSD and PATA interfaces. The board is 4 layers; due to USB2.0 routing requirements / impedance matching. Why the Sparkfun Edison Block formfactor? Well simply put; I wanted to be able to expand the “system” with more features I don’t forsee at the moment. Example: I do not currently need an SDIO card on my Sled – honestly; I’m lazy and don’t want to route the pins. But; if later I need it – I can just buy Sparkfun’s Block and add it to the system. I’m requesting comments / suggestions / peer reviews for the design; as a result I’m posting it here. The first 3pages of schematics are Licensed to you as Derivative works of Intel and Sparkfun. The last 3 pages and the PCB Layout are currently ALL RIGHTS RESERVED Copyright 2015 by John Zitterkopf. ATM; I’m thinking I’d release the final design under a TAPR/NCL license… but I haven’t committed to that yet. In addition to the features above; I’ve designed in some USB Muxes to aid switching the Edison into Device or Host mode (similar to the Intel Edison Arduino board). I’ve also included the Lipo Battery charging circuit to provide a limited UPS type capability to the design incase of small power outages due to lightning or what not. 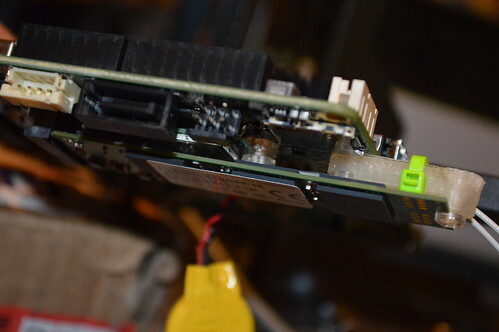 Lastly; I added an I2C eeprom which can be programmed by the Edison for the USB to SATA bridge chip. The passing of Leonard Nimoy @ 83 on Feb 27, 2015 made me want to do something special in honor of the legendary actor. I decided to give everyone ordered between his passing and 3/6 a 10% discount at my web store with matching 10% donation in memory of Mr Nimoy to the COPD Foundation. His family has asked us to do this instead of sending flowers. With the sale over; I crunched the numbers and determined that the donation would have been $68.44; but I wanted to give a little more from my personal pocket book – adding another $20 to make it $88.44. Thanks to all my fellow #Pinball enthusiasts on Pinside for making this donation possible. 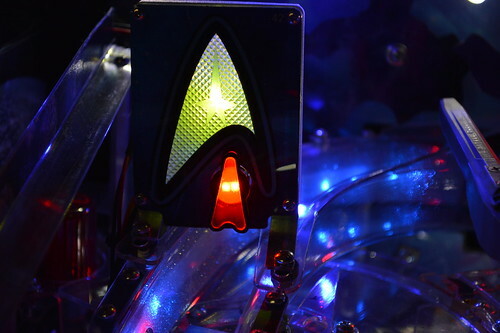 One of the items that somewhat bugged me about my new Stern Star Trek LE Pinball machine, was the LED in the warp ramp popup insignia. Specifically; I always thought the two SMD red LED didn’t quite fit where it was placed in the machine. I recreated the arrow using red; then added the black border around the plastic to block light and give a round area to mount the new LED. 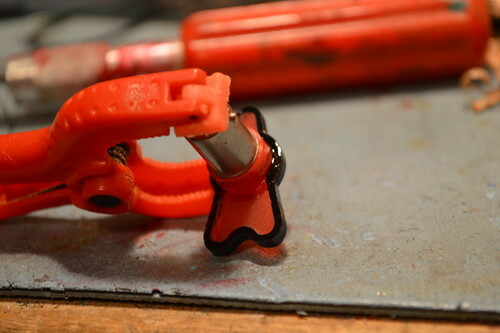 Once I had the recreated arrow; I broke it into two laser cut pieces. One would be cut out of the matte/diffused Red acrylic which was used on the Stern Star Trek Pop Undercaps. The second would be cut out of 1/8″ opaque black acrylic – this piece serving as an outline for the red piece and support from the LED. 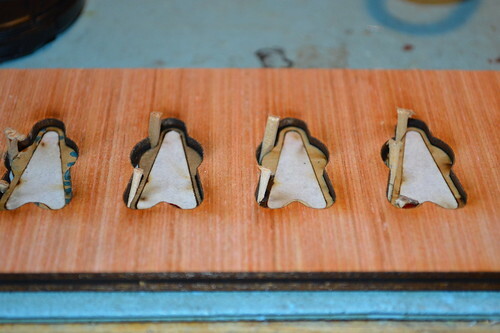 With the pieces together; I used some acrylic bonding solvent to glue the two pieces together. I let the acrylic bond overnight. I’m really quite happy with the way this turned out. It defiantly spruces up the warp assembly. 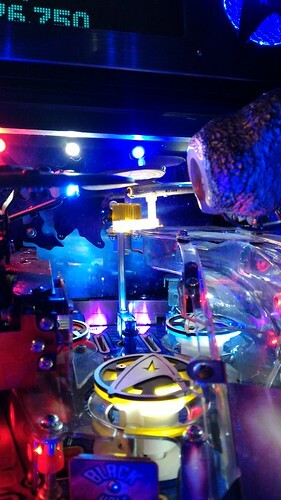 The Mod must be unique for the Star Trek machines: Pro, Premium, or LE. General Stern mods are not allowed. Mods are sorted by assigned category alphabetically – then by Price ascending (not including shipping). No special treatment will be given to any vendor. Mod Name should be descriptive and will link directly to manufacturer’s site first; in the absence of that the Primary distributor. Where possible; Original Pinside thread / announcement should be included. If the mod is specific to a particular flavor of machine; it must be noted. Mods the cease manufacturing and are permanently out of stock may be removed from list without warning. Mods must be accurate to the JJAbrams universe. Additional rules or changes to the rules may be added as the community provides feedback. Manufacturer’s are free to request addition, provide corrective input, or request to be removed from this comprehensive list. Suggestions to improve this list are welcome. Post here or by private IM. For the moment; this list is a living shared spreadsheet on a google drive. Only I have editing rights; for the time being. Eventually I’d like to figure out a way to post this list here in the thread for easier first pass glance. At the moment – ALL RIGHTS RESERVED. 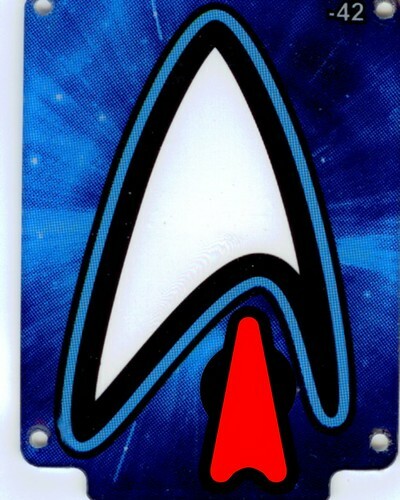 Art Star Trek Lockdown plate discontinued? (40) ?Pro Only?